Cumbria Community Foundation celebrates its 20th anniversary in 2019. Since 1999 the Foundation has grown from being a fledgling organisation to one that is firmly at the heart of community life in the county. Through its grant making and fundraising it has made significant contributions to the lives of some of the county’s most disadvantaged people. 2019 will be a year of thanks and celebration for what has been achieved so far. But more importantly it is about the future and how we build philanthropy in Cumbria together. We have titled the year ‘Giving Back, Looking Forward’. It will be a year in which we hope to widen people’s involvement in the Community Foundation. We hope to see lots of smiling faces and fun, many new individual and corporate members and a host of people creating funds or joining us on a journey to creating a fund. We also want to encourage lots of new conversations about the issues in our community and philanthropic solutions. As part of our year-long campaign, we are encouraging people and businesses to get involved and take part in a challenge to help raise money for the Cumbria Fund, which supports around 50 community projects each year. The money helps a wide number of people, including youngsters, vulnerable adults, the disabled, those recovering from illness, the unemployed and low-income families. 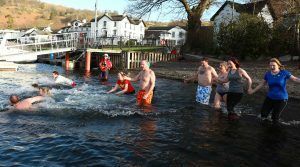 Not being one to shy away from a challenge, and to encourage others to fundraise with us, staff and trustees wanted to do their own fundraising event, so on the 8th of January some of the staff and trustees submerged in Windermere – all without thermals and wetsuits – we couldn’t ask people to support the anniversary challenge if we couldn’t do it ourselves!